Springtime for Dubcek–whose author, Scott Brown, does nice work on Slovak and Czech political cartoons–offers a nice roundup of Entropa related images here. A Fistful of Euros–which does extraordinary work on European economies–offers another summary and links here. And if that weren’t enough, there’s a link to its entry on European stereotype jokes here (some of them particularly stereotypical). Actually I found the discussion below by accident, but it raised my already high spirits. Not only does have the marks of a good discussion including reference back to the original source, supplement of that reference, comment on it from multiple sides, normative evaluation and a post linking it to historical precursors, but it appeared in a delightfully unlikely place–the discussion board for Skate2 on IGN.com which describes itself as “the ultimate gaming and entertainment resource featuring award winning coverage of video games, cheats, movies, music, cars, sports, babes, …” I suspect the fact that I find this delightfully unlikely says more about my too-limited perspective than it does about the actual unlikeliness of the location. So I learn…and take delight. black will not be asked to get in back, when brown can stick around.. when yellow will be mellow… when the red man can get ahead, man; and when white will embrace what is right. I didn’t really like that part. But hey, whatever dude. I didn’t like the white part because it makes it seem as if all whites embrace what is wrong. CoolEric2 posted: I didn’t like the white part because it makes it seem as if all whites embrace what is wrong.That’s just me though. I’m not white btw. I think this little rhyme was created back when segregation was still around, which is why the part about whites is in there like that. After months in Slovakia hearing reasons why Americans would not vote for Barack Obama for President (including some from Americans) the question is how President Barack Obama will relate to Slovakia. On Monday I received a series of excellent questions from SME. Since space considerations dictated the publication of responses to only the most immediately interesting–see http://www.sme.sk/c/4270545/bratislava-nebude-obamovo-mesto.html (I am still waiting for the day when articles in Slovakia’s newspapers regularly exceed the 500-word mark, something that should be possible in the internet era)– and since I would hate to let my 10 minutes of top-of-the-head responses go unpublished, I post below both the questions and my answers. Why is America and American president important for Slovakia? Which American presidents can we consider as very important for Slovakia and Slovak nation? As the world’s largest economy and largest military the United States has an almost unavoidable efect on every country. It is unlikely that the new administration will have much practical significance for most citizens of Slovakia, but in symbolic terms this inauguration is one of the most important in the past century, and the excitement among Americans—particularly the college-age students I teach—is unprecedented in my lifetime. Among those American presidents who have had a deep influence on Slovakia’s development it is difficult to name any except Wilson, who aided the creation of Czechoslovakia, and Roosevelt who pursued a successful course in the Second World War. Some might cite Reagan, but scholarship suggests that his effect on the collapse of the Soviet Union was marginal at best—a matter of timing rather than outcome. Let’s look back to the history of Slovak-American relations – how do you see its development from 1993 independent Slovakia until now? What were the turning points? The turning points in US-Slovakia relations are really the same as the turning points in Slovakia’s own politics. Relationships between the Clinton administration and the successive Meciar governments cooled very quickly and remained quite cold during the 1990’s, though I never got the sense of any animosity toward Slovakia itself. The defeat of the HZDS government in 1998 improved relations, both because the new government seemed more firmly committeed to democracy and stability in the region which helped aussuage the long-term concerns of the State Department. The new government then ingratiated itself further through active cooperation with the Bush administration‘s foreign policy goals, even to the extent of supporting the war in Iraq. Under Fico the government has pulled back from this active cooperation and has offered some sharp criticisms, but it is not clear to me whether this has translated into a relationship that is more conflictual at the operational level, and it is notable that the US has moved ahead with the process of reducing or eliminating visa requrements. May we expect Obama’s visit to Slovakia or Europe in the next years? When and why? Don’t you think European countries and leaders are expecting too much from Obama in sense of „monumental change“ in mutual relations and US foreign policy? I think almost everybody (except maybe Sarah Palin) is expecting too much from Obama. I think his policy will certainly differ from that of the Bush Administration, but that administration’s policy stood near the extreme of unilaterialism. Obama will not transform American diplomacy, and he will not radically reshape relationships with adversaries or allies, but he will bring it back toward the norm under Bill Clinton (and this is no surprise given that Hillary Clinton will be the Secretary of State). The US under Obama promises to be a country that will make strong efforts at multilaterialism but that will still act unilaterally if it feels that its interests will be otherwise threatened. Our last government presented itself more in the light of euro-atlantic cooperation, current government is more ambiguous. May this play a role in mutual relations in sense of change of American position towards Slovakia after Obama is inaugurated? I will be interested to see whether the Fico government changes its relationship once the United States has a government closer to the economic left and more prone toward multilateralism. My sense is that foreign policy stances and foreign policy rhetoric in Slovakia have been driven largely by domestic political considerations. I do not know whether the relatively more left-of-center positions of the Obama presidency will change those considerations and shift the positions or rhetoric of the Fico government. David Cerny’s exhibition catalog for “Entropa” is the only thing connected to the EU that has ever caused me to laugh out loud. There is such remarkable cleverness here that I want to think about it out loud as well, but it is hard to do it without drifting into pretentious art criticism. So I will be try to brief. At face value Cerny’s proposal for the artwork claims to want to force Europeans to confront the offensive stereotypes they have about those from other member states and calls for “self-reflection” and “critical thinking”? In other words, stereotypes are a joke. But since the artwork seems to reinforce those stereotypes (ask Bulgarians about Turkish toilets), the artist claims (obliquely in the artwork’s catalog and explicitly in his apology) to want Europeans to ask whether they can tolerate the stereotypes that other Europeans have about their own respective countries, since the “capacity to perceive oneself as well as the outside world with a sense of irony are the hallmarks of European thinking.” In other words, maybe the real joke is that people don’t get the joke. Amid all of the (not uninteresting) arguments about stereotypes, offense and irony obscure the most remarkable thing about this work: that it is there at all. He has succeeded in placing an artwork that many find deeply offensive into the middle of an EU building, and forcing Czech Republic to start its EU presidency with an apology. Mission accomplished. Without trying to pursue analysis for which I am not trained, the main point for me is the weakness of official power. The point is that Cerny managed to get this past everybody, managed to invent artists from 26 other countries without anybody noticing, managed to insert the potentially offensive bits in full public view (the Bulgarian toilet is part of the catalog, couched in artspeak–” intentionally primitive and vulgar, faecally pubertal”) and–shielded by the debate (which he framed himself) over stereotype against “sense of humor” (and who wants to be accused of lacking one of those)–he may well manage to keep the thing hanging in Brussels for the next six months. That is some remarkable art. In 2000, I was cutting through the Lucerna pasaz in Prague when I came upon Cerny’s “Horse” and nearly fell down laughing. Again, the amazing thing was that he had punctured–actually obliterated–a core national myth within a few hundred feet of the real statue (see http://www.ce-review.org/99/19/pinkava19.html and Cerny’s own webpage: http://www.davidcerny.cz/EN/vaclav.html, especially his commentary). To overthink this for a moment (because the real point is that it is really funny), I think Cerny’s art is funny to me because it says that the powers that be are not as powerful as they think. I’m sold on the theory (thanks to Mark Lutz) that one of the reasons we laugh is that we are relieved to find out things we were afraid of are actually not that fearsome. If Cerny could manage to paint a tank pink or mock a national hero, then maybe there were a lot of things that the rest of us could get away with. So in this sense Cerny’s exhibits follow in the tradition of resistance through humor from the Good Soldier Svejk to the Theater of Jara Cimrman and the staged actions of the Committee for a Merrier Present (Spolecnost za veselejsi soucasnost), except that Cerny’s work came after the fall of Communism. (Havel’s Power of the Powerless suggests something like this, suggests that western governments have their own kind of anonymous bureaucracy; Terry Gilliam’s Brazil makes the same point). 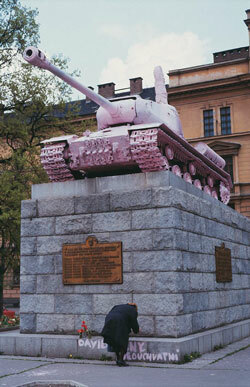 The fact that such guerilla art was still funny said something about our continued fear of the powers that be–from the continued influence of Russia (and those too afraid to fight it) connected to the Pink Tank, to the turn toward national reverence questioned by “Horse.” Now the target is the European Union and for better or worse, the joke is still funny. First, Cerny’s “apology” is itself a work of art, a beautifully designed document designed to admit just enough to keep the conversation going. It is delightfully multilayered including the final sentence:”the piece thus also lampoons the socially activist art that balances on the verge between would-be controversial attacks on national character and undisturbing decoration of an official space.” It is yet another beautiful irony that the presumed goal of the apology–keeping the artwork hanging–makes it yet another example of the kind of art that Entropa is supposed to be criticizing. Second, it is amusing to me that a piece of art allegedly about national stereotypes plays directly to my own stereotypes. When I think about what I love most about Czechs, I think about their penchant for subversive humor. This is itself a stereotype, I think. There’s no reason that Czechs are any more likely to do this kind of thing than those of any other national group. At the same time Czechs do seem more likely to embrace this kind of humor as part of their national heritage than do other European countries. In that sense, Cerny’s Entropa itself is just as much an example of stereotype as the alleged pieces in his artwork. Finally, Cerny’s exhibition catalog really repays careful reading, ranging from parody of artspeak to gems worthy of Douglas Adams. The Czech entry includes “A constant stream of brilliant Václav Klaus quotes. Words of wisdom that deserve to be etched in stone” but which must settle for being flashed on an LED. Boris Spernoga, (Slovakia), “Vernisaz,” Artforum Kozia, Bratislava (funny to me alone, because this is across the street from our apartment in Bratislava).